Stroke is most commonly the outcome of an obstruction of blood flow in a major cerebral vessel (usually the middle cerebral artery), which, if not resolved within a short period of time (minutes), will lead to a core of severely ischemic tissue that may not be salvaged. However, the ultimate size of the brain infarct also depends on the “penumbra,” a zone of tissue around the core of the infarct where blood flow is still maintained above a neuronal disabling level or the critical 20–25% of normal blood flow. If blood flow in the penumbral zone further decreases below a critical level of flow, the infarct zone will inevitably expand. 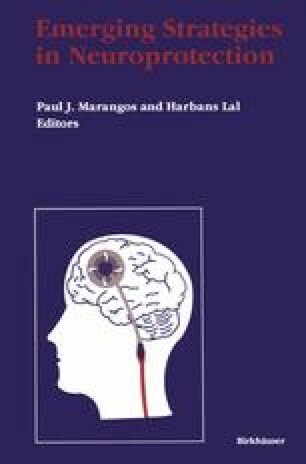 The blood flow, therefore, is the driving force in determining the size of the core infarct and penumbral zones by providing the conditions essential to maintenance of cellular energy hemostasis (Siesjö, 1988a). The decrease in blood flow leads to reduction in phosphocreatinine (PCr) and ATP (especially the latter), and, if ischemia is prolonged, the energy source depletion will be sufficient to lead to severe impairment of cellular function by disruption of ATP-dependent processes (e.g., N+ /K+ ATPase). However, anoxia (lack of oxygen per se) may allow prolonged cellular survival (1 hr), which upon restoration of energy is not necessarily associated with the neuronal death seen in shorter episodes of brain ischemia. This discrepancy has forced researchers to examine the rapid consequences of ATP depletion which may not be readily reversed upon restoration of energy levels such as loss of ion homeostasis.